cereal first, or milk first? I had this discussion with my coworkers a couple months ago- when you eat cereal, do you pour the milk first or the cereal first? the correct answer is cereal first, because if you put milk first, how will you know how much cereal to pour? but another option, according to one of my coworkers, is adding ice cubes to your cereal to keep the milk cold. i'm good, but kudos to you if you do this. kix was my favorite cereal growing up. berry berry kix was another favorite, as long as i got to it before the ants did. i alternated between kix and lucky charms with the occasional raisin bran and honey nut cheerios. and in college, my roommate and i devoured honey bunches of oats and special k. it was a team effort- i bought the cereal, and she bought the milk. i found a new favorite when i moved to the bay- golden grahams. there's no correlation between golden grahams and the bay (at least, i don't think so? ); i only started eating them because they were one of the breakfast cereal options at work. they're basically the less sugary version of cinnamon toast crunch! for these bars, melt the butter, browned a little, and marshmallows, with a splash of vanilla. 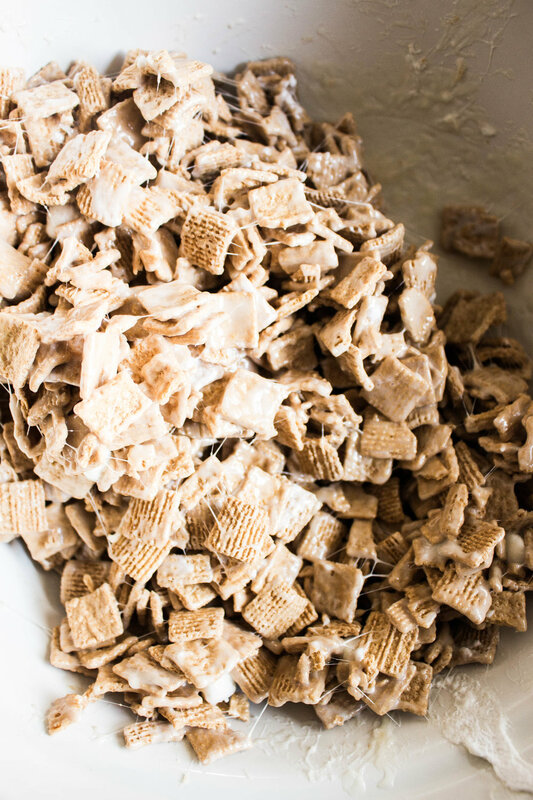 pour the mixture over golden grahams cereal and a couple handfuls of unmelted mini marshmallows. stir, press into a pan. drizzle melted chocolate, let it cool, and cut into squares. s'mores without the mess and with more portability. 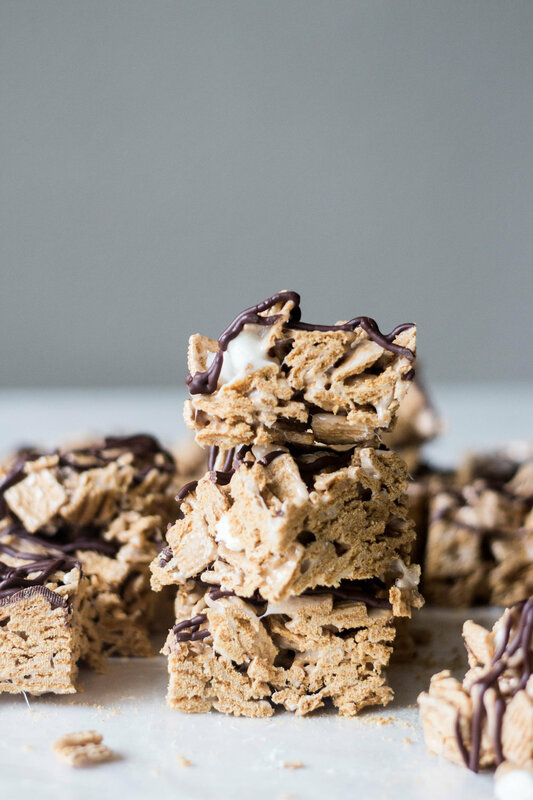 they remind me of rice krispies treats but with mini graham cracker squares and a chocolate drizzle. they're so gooey and so, so addicting. 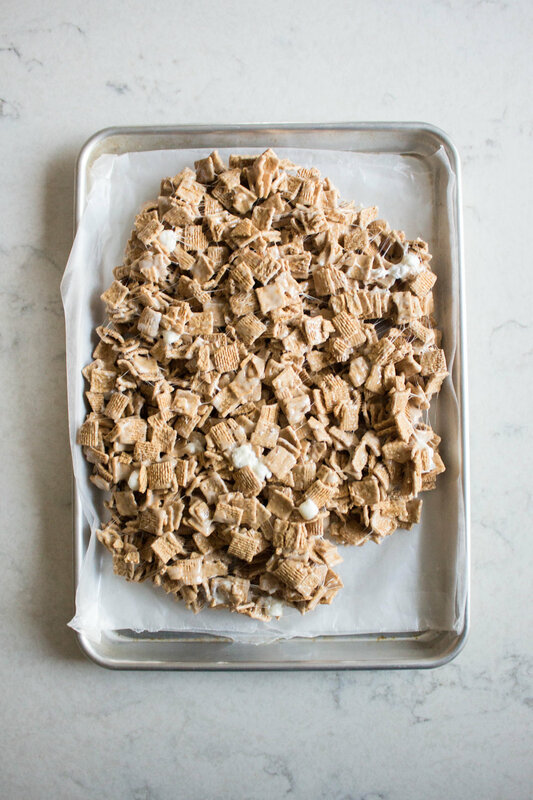 baker's notes: you'll notice in the recipe below that the marshmallows and cereal are divided. i remove some of the marshmallows so there are a couple whole marshmallows in the bars. i also set aside two cups of the cereal to produce a higher marshmallow to cereal ratio, meaning more gooey-ness. i like freeforming the bars on a jelly roll pan, but feel free to press them into a 9x13-inch pan for a more compact bar. line a jelly roll pan or 9x13-inch pan with wax/parchment paper (see baker's notes above). set aside. set aside about two cups of the golden graham cereal. make two bowls of cereal, save it for a snack later, i dunno, but you won't need those two cups for these bars. 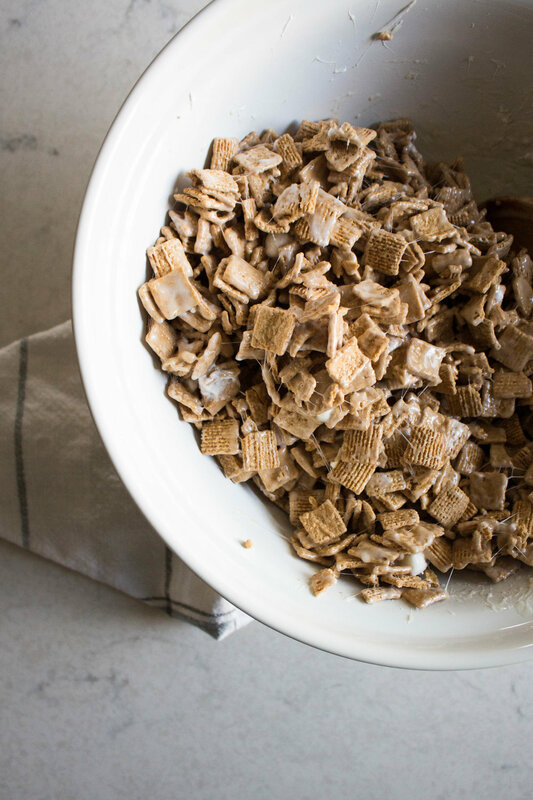 in a large bowl, stir together 3/4 cup of the mini marshmallows and the rest of the golden grahams cereal. in a medium pot over medium heat, melt the butter (brown it just a bit if you'd like). add the remaining mini marshmallows and vanilla extract, and melt until smooth. pour the melted marshmallows over the cereal mixture, and stir to combine. it'll be sticky! in a small bowl, melt the chocolate chips in the microwave in 30-second bursts until the chips are completely melted. pour the melted chocolate mixture into a ziploc bag (makeshift pastry bag). push the melted chocolate to one of the bottom corners of the bag, and snip off a small corner. 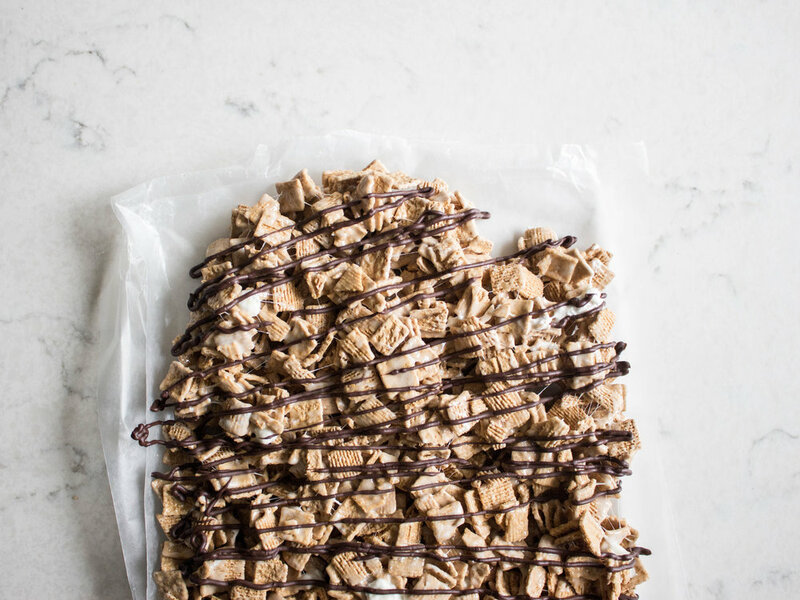 drizzle the melted chocolate over the golden graham bars. let the bars cool for at least an hour (you can hasten this in the fridge) until it's solidified a bit. cut into squares/bars and devour!! !